Alofanib(RPT835) is a novel selective allosteric inhibitor of FGFR2 and has a dramatic inhibitory effect with IC50 <10 nM on FGF2-induced phoshphorylation of FRS2a in KATO III cells. It has no direct effect on FGF2-dependent FGFR1 and FGFR3 phosphorylation levels in either cell lines and no effects on FGF2-FGFR2 binding. Gambogenic Acid, identified from Gamboge, is an inhibitor of the FGFR signaling pathway in erlotinib-resistant non-small-cell lung cancer (NSCLC) and exhibits anti-tumor effects. Derazantinib(ARQ-087) is an orally bioavailable inhibitor of the fibroblast growth factor receptor (FGFR) with IC50 values of 1.8 nM for FGFR2, and 4.5 nM for FGFR1 and 3, showing lower potency for FGFR4 (IC50=34 nM). It also inhibits RET, DDR2, PDGFRβ, VEGFR and KIT. Western blot analysis of the expression and activation status (a) of pFGFR, pERK and Bim after treatment of API5-overexpressing cells (a) with either DMSO or SSR128129E. H3B-6527 is a highly selective covalent FGFR4 inhibitor with an IC50 value of <1.2 nM and at least 250-fold selectivity over FGFR1-3 (IC50 values of 320, 1,290 and 1,060 nM respectively). KYSE150 and KYSE450 cells were treated each day with 1 μM H3B‐6527 or left untreated for three days, and lysates were immunoblotted with indicated antibodies. Western blotting demonstrated that the expression of EMT‐related markers (E‐cadherin, N‐cadherin, Claudin‐1, Vimentin, and Snail) was altered with FGFR4 blockade. Erdafitinib (JNJ-42756493) is a potent and selective orally bioavailable, pan fibroblast growth factor receptor (FGFR) inhibitor with potential antineoplastic activity. NSC12 is an orally available pan-FGF trap able to inhibit FGF2/FGFR interaction and endowed with promising antitumor activity. BLU-554 is a potent, highly-selective, oral FGFR4 inhibitor with an IC50 value of 5 nM. The IC50s for FGFR1-3 is 624-2203 nM. PRN1371 is an irreversible covalent FGFR1-4 kinase inhibitor, with IC50s of 0.6, 1.3, 4.1, 19.3 and 8.1 nM for FGFR1, 2, 3, 4 and CSF1R, respectively. FIIN-2 is an irreversible, pan-FGFR inhibitor with IC50 of 3.09 nM, 4.3 nM, 27 nM and 45.3 nM for FGFR1/2/3/4, respectively. (E,G) Microscopic appearance of peritoneal dissemination of YTN16 (E) without BLU9931 and (G) with BLU9931 treatment for 3 weeks. (F,H) Microscopic features of s.c. tumor of YTN16 (F) without BLU9931 and (H) with BLU9931 treatment for 3 weeks. YTN16 tumor under treatment with BLU9931 does not form glandular structures. 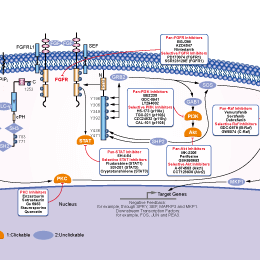 SUN11602 is a small synthetic compound that mimics the neuroprotective activities of bFGF and activates key molecules in the FGF receptor-1-mitogen-activated protein kinase/extracellular signal-regulated kinase-1/2 kinase (FGFR-1-MEK/ERK) signaling pathway.